Using a bit of poetic license, I am twisting the rules on Cathy’s In A Vase On Monday challenge to offer a vase filled using materials gathered not from my own garden this week, but rather from my sisters’ lovely garden. Yesterday we had a wonderful family gathering at the home of two of my sisters. Earlier this spring a freak storm in their area had dumped over 6 inches of rain in a brief amount of time, overpowering the culverts and causing severe flooding in their neighborhood (as well as in other parts of the city). The water receded quickly once the storm passed, but the water coursing thought their yard had left a path of destruction and detritus. Despite this inauspicious start to the spring gardening season, their garden now looks beautiful again. It has been quickly restored: mounds of debris removed, fountains repaired, herb garden replanted, shattered glass bird bath replaced, containers repotted and more. Many hostas were lost but fortunately their collection of hydrangeas survived intact. In fact, I was drooling over the ones on their coffee table and mantel all afternoon. And lucky me, before I left yesterday one sister took me out next to the pergola to cut a variety of these multicolored flowers for a take-home bouquet. 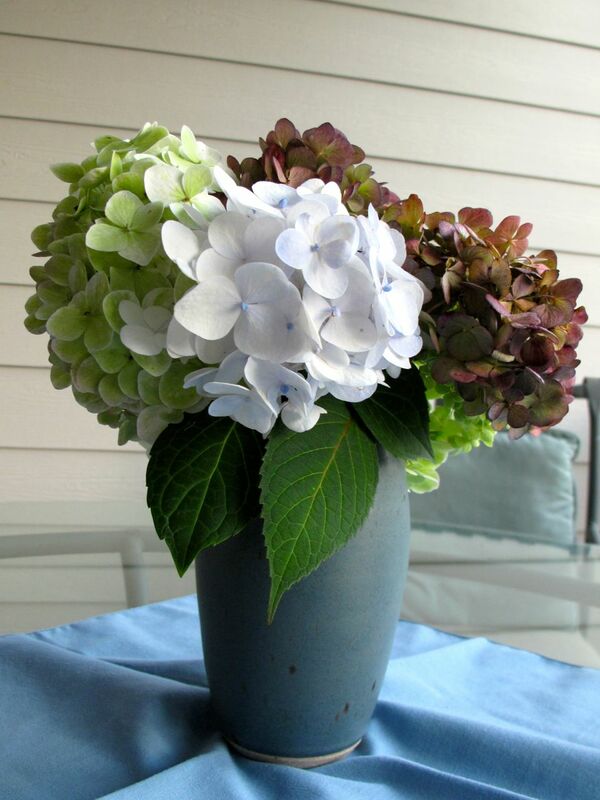 Once home I chose a dark blue ceramic vase as a container. After admiring the hydrangeas for a few minutes, I found the flowers practically arranged themselves. I removed almost every leaf, then shortened the stems several times until the flowerheads draped easily together. Unlike many of my floral designs which are intended to be viewed from the front, the graceful hydrangeas in this arrangement flow one to the next and encourage the viewer to follow. 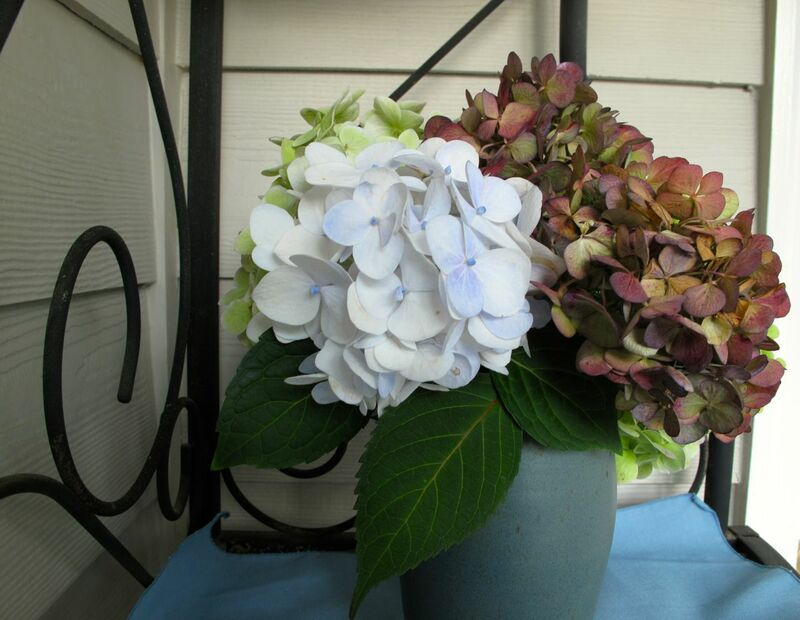 I love hydrangeas and am certain to enjoy this arrangement all week, thanks to my generous sisters and their inspiring garden. Thanks to Cathy at Rambling In The Garden for hosting. Visit her and discover what she and others are placing In A Vase On Monday. 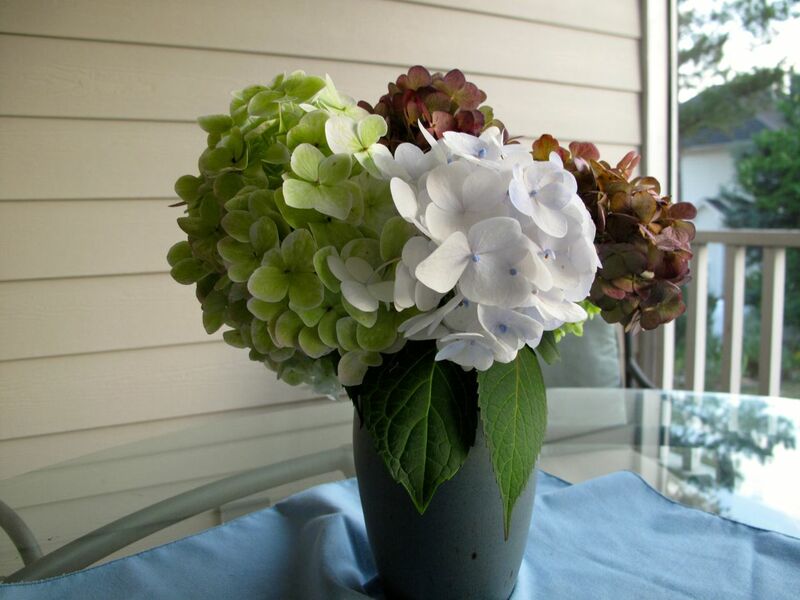 This entry was posted in garden and tagged flower arranging, flower design, hydrangea, in a vase on monday, nature photography on July 14, 2014 by pbmgarden. Susie this is fabulous. 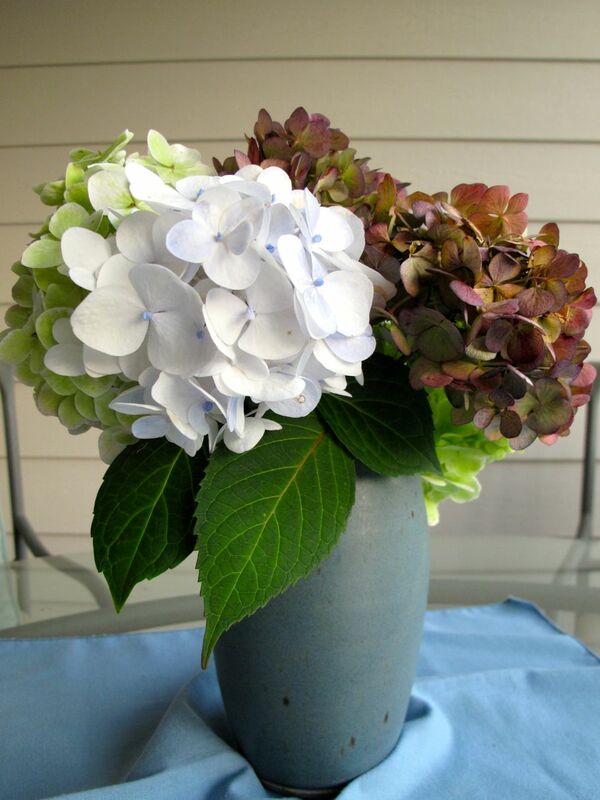 I miss my hydrangeas as I have 2 flowers from mine this year…I did my first vases this week and have them in my post. Thanks Donna! Well enjoy those 2 hydrangea flowers and look forward to next year, right? I am trying to get some hydrangeas started in my garden but they’re not doing well. I’m always awed by the sheer size of hydrangea heads. Your sister’s plants are really really lovely. I also like that you placed them simply and didn’t muck up the vase with anything that would take the eye away from their beauty. Thank you. 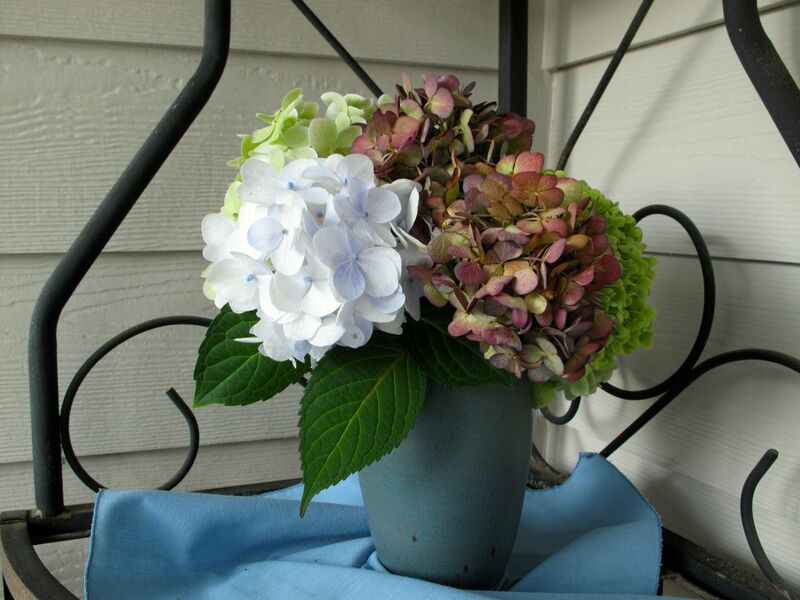 I was so thrilled with using the hydrangeas I didn’t even think to add anything else. Lovely Susie. The perfect way to display the Hygrangeas. I love the white one, I’ve always said I wouldn’t have any of them because they need so much water but on the terrace under the wisteria would be an ideal place for some in pots! Thanks Christina. Yes, placing some in pots close by where they can be easily watered would be a good idea. Beautiful, they really do fill a vase. Wish I had more luck with them but only the hardier types manage to put on a show around here. Glad your sister made it through the rough start. Six inches of rain sounds like a nightmare! Thank you. I find myself in good company then as I don’t have good luck with hydrangeas either. My sisters have taken the big event rather philosophically and just set to work setting things right. At least the water didm’t stand for long before receding. I’ve been eyeing up my own hydrangeas thinking I should pick some – you’ve convinced me! Lovely. Yes, go for it Janet. Even one or two will make a big impact. Green with envy over this arrangement and the story that goes with it. A garden with hydrangeas is a garden one will remember. I’m going to remember that gardening adage Stepheny and try harder to grow my own hydrangeas. I have a few promising starts but still nudging them along. My sisters were champs about the damage and just got on with setting everything back in shape. It was heartbreaking to me to hear about it but when I visited yesterday the garden held few signs of the trouble. I didn’t do anything special to condition the stems. Thanks Kris. I don’t have much shade either so I understand your dilemma. Former gardens are hard to let go of aren’t they? Every spring I miss the azaleas and dogwoods from my past garden. Gorgeous Susie. I particularly like the white one with green centres. 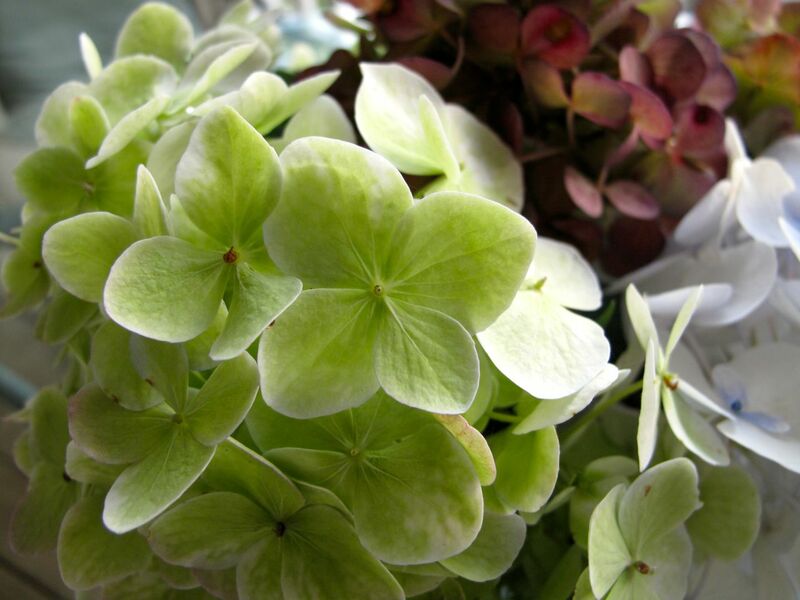 Hydrangeas are easy from cuttings, perhaps your sister could spare you a few pieces? Thanks Chloris. 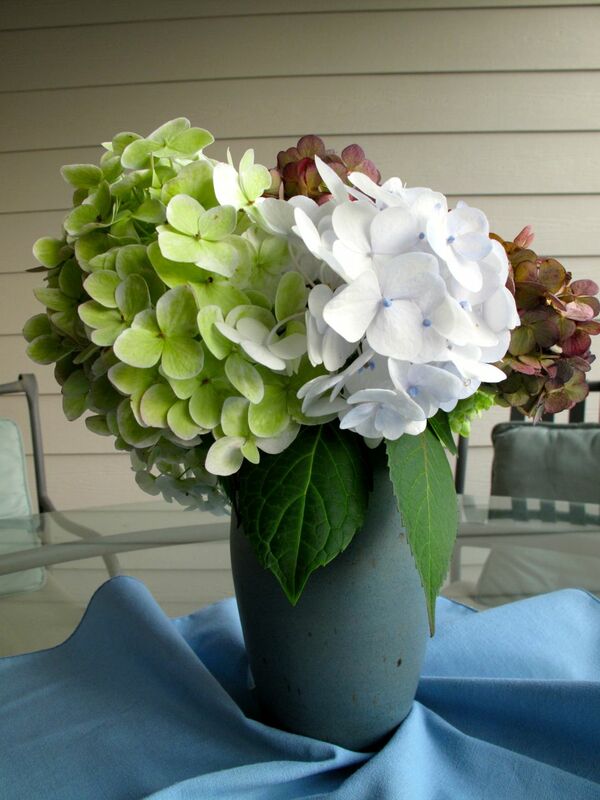 When I was growing up I knew only the blue mophead hydrangea–there’re are so many more. I’ll talk to my sisters about getting some cuttings. Would be worth a try. I love hydrangeas, but with the terrible winter we had, my two main bushes didn’t flower at all. They had buds in January but then with all the cold, each and every bud froze. Lots of green, but no flowers at all. Very sad indeed! These are just gorgeous and of course will dry beautifully too! 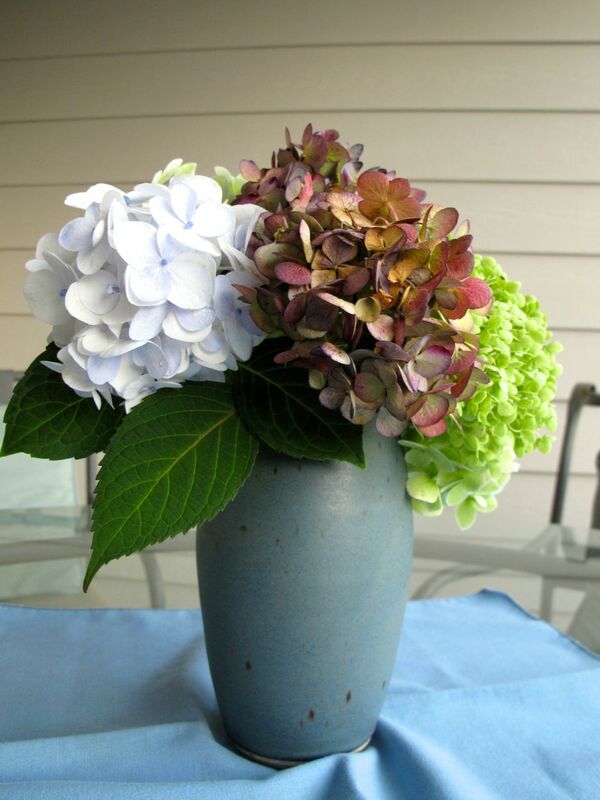 Libby, I had the same experience with my two mophead hydrangeas as you did–done in by cold weather. We’ll have to look to next year. I think I will try to dry these and see how they turn out. Thanks Alys! 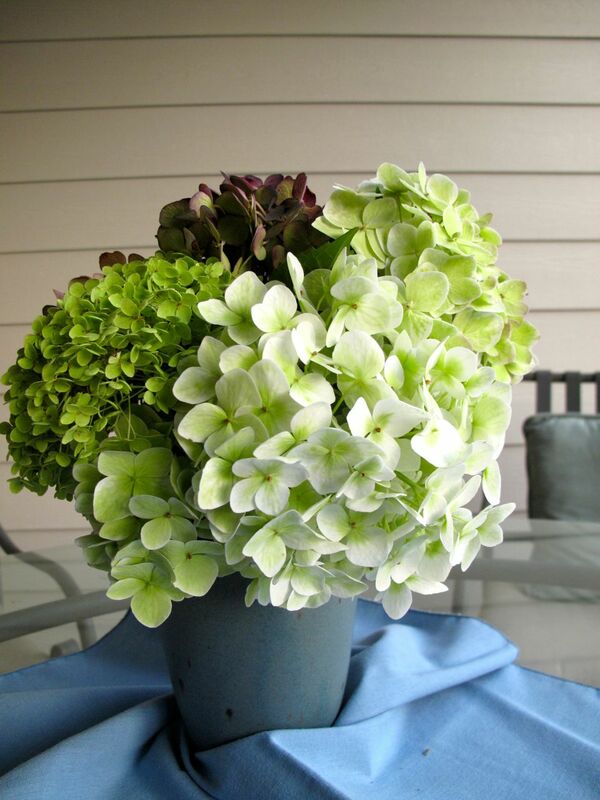 Your hydrangea arrangement turned out lovely. 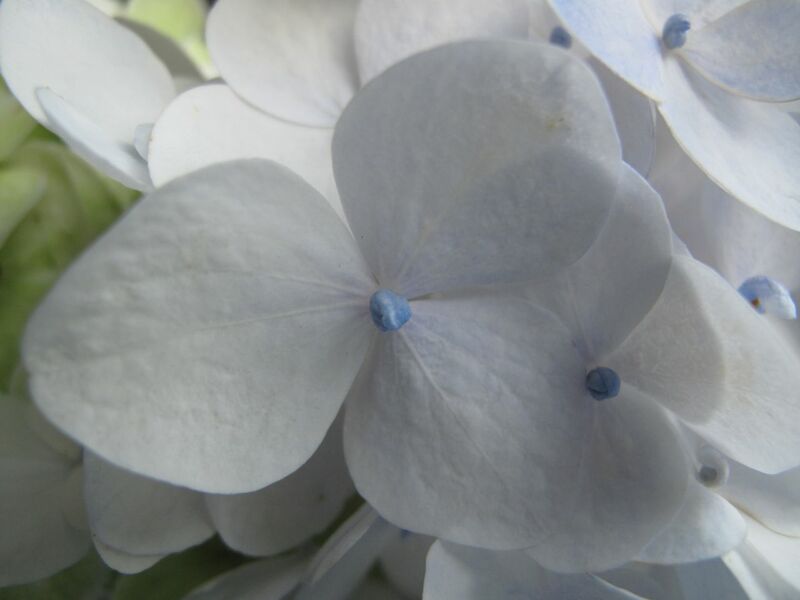 I love the creamy white hydrangea. The white has bluish tints and a pale blue center. I like it too. I am really enjoying these hydrangeas. Thanks so much Judy! Stunning photo, love the arrangement and the presentation is special…Well done. 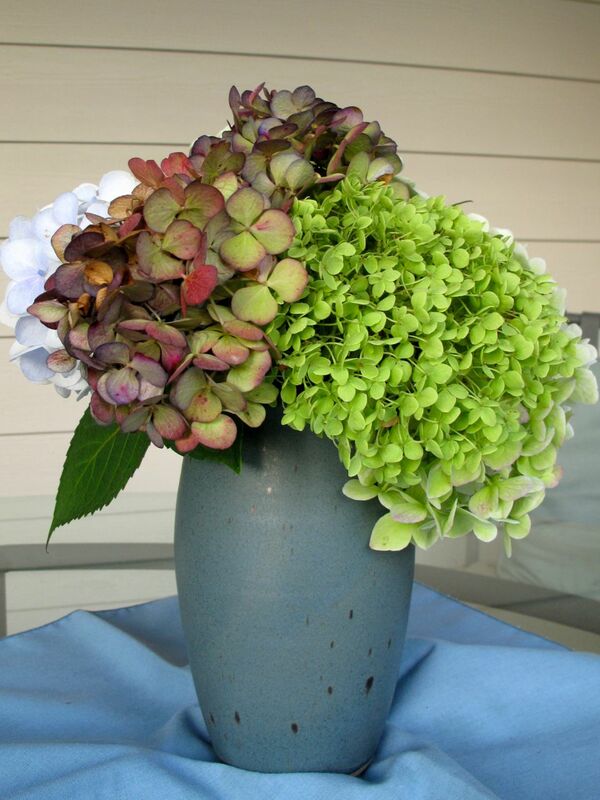 Your sister has quite a collection of Hydrangeas and your arrangement is gorgeous, blended smoothly with the vase. Thanks. My two sisters share a home and lovely garden that came with hydrangeas, ferns, azaleas, camellias and more. And they are enhancing it with their own favorites. I always enjoy visiting them and was happy to get to see their hydrangeas this week. Gorgeous, gorgeous, gorgeous! How wonderful to have access to your sister’s beautiful garden, and to be able to combine all those types of Hydrangeas together for a bouquet! Thanks Beth. It’s nice to have sisters and they have a nice garden.